When Should I Get A Prenup? In not too distant past, prenups were not legal as living together without being married was considered against public policy. However, nowadays they are legal and in fact, several provinces have statutory provisions codifying their legality. 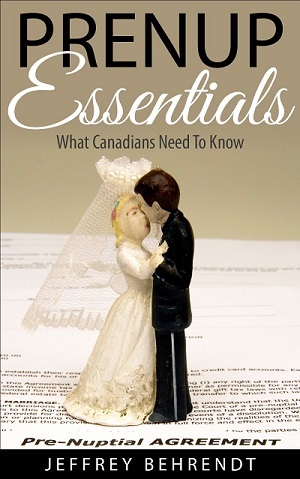 In Ontario, section 53 of the Family Law Act is the statutory authority permitting them. 1. Signatures and Witnesses. A prenup must be in writing (no oral prenups), and signed by both parties entering into the agreement. Each signature must be witnessed (and it is a good idea to use someone whom you will be able to locate many years into the future if needed). 2. Financial Disclosure. You and your partner must provide complete disclosure of your financial situation to each other prior to entering into a prenup. The disclosure include both income and financial assets. Financial disclosure must be detailed – i.e., it’s not enough that your partner knows you own an RRSP, they must also know its value. Courts take the view that you can’t intelligently enter into a prenup without this information so if this isn’t done, your prenup risks being invalidated by a judge. It is a good idea to include the financial disclosure as a schedule to your prenup, or at least keep the papers showing financial disclosure was made. 3. Duress or Coercion. As is true for any type of contract, duress or coercion to enter into a contract can result in the contract being invalidated. So, don’t put pressure on your partner to sign a prenup. Often the pressure won’t come from your partner, but your partner’s family – perhaps their mother or father. That sort of duress or coercion can also result in a prenup being invalidated. In other words, courts only enforce contracts that are entered into by both parties of their own free will. 4. Grossly Unfair. Judges can also invalidate a prenup on the ground that it is grossly unfair. For instance, if after a long term relationship one partner is left destitute while the other is extremely wealthy, a court is likely to step in and address this perceived injustice by voiding the prenup. 5. Illegal Clauses. Certain things are not permitted to be in prenups. The most important of these things are clauses relating to child custody and child support. As well, this includes any illegal acts or “moral” type clauses such as penalties for adultery. If these sorts of clauses are included in a prenup, they normally will be struck out without affecting the rest of the agreement. In short, if you are fair about things when entering into a prenup, and follow the required rules, the chances are very good that your prenup will be valid. You’re Invited to Call or E-Mail! If you’re considering a prenuptial agreement — or have already made your decision — you’re invited to call or email us. We’ll explain for free how you can protect your assets and plan your estate. You can call us toll-free at 855-PRENUP-4 or email us using our contact form here. We can help you anywhere in Ontario. my partner and I are thinking about getting a prenup before our marriage in May. My partner has Canadian citizenship and I am a German citizen. In the future we are planning to live in Germany. Now, my question is whether we will be able to transfer the Canadian prenup to Germany and whether it will be valid. Also, do your services include a notary certification of the prenup document? @Nicola – You would need to consult with a German lawyer as to whether a Canadian prenup is valid there. It is quite possible that it is not. If you plan on living in Germany, then you should get a German prenup. As well, note that prenups in Ontario do no need to be notarized. My partner is Canadian and I am American. If we get a prenup agreement with you guys, will it be valid in the US (we do not yet know in which country we want to live permanently). Thank you! @Sarabrynn – You would need to check with an American attorney in the state in which you plan to live to determine whether a Canadian prenup will be valid there. Even if it is valid there, it is possible that it may not have the effect there that you wish it to have. One thing you can do is get two “mirror” prenups – one in Canada, and one in the US, that say the same thing. That way you can be certain that regardless of where you live, you will have a valid prenup. Does it protect the existing assets one owns, as well as the assets one party will acquire as part of their business? @Andy – Yes. A prenup can protect property acquired either before or during a marriage. The only time a young couple might want a peatarimrl agreement is when one has significant assets from family and the family wants to make sure that, in case of divorce, there is some certainty about how much will go to the spouse for property division and support. Agreements like that would create a level of comfort for family-owned businesses and other family assets, knowing that, if a divorce occurs, the amount a spouse would get would be the amount in the agreement, not a share of family estates or businesses. If I do my prenup agreement using the bronze package. what should I do after? print the doc and sign it in a notary with my fiance? @Chris – All the instructions are included with the package. Notaries are not used for prenuptial agreements. Hi There, I’m Canadian and my wife to be is from Russia. Marriage is necessary for the immigration process. The way I see it we can only get a prenup in Russia which may not be valid in Canada. Is there a better way? @Michael – You can get both a prenup in Russia and a prenup in Canada. Both would say the same thing, but be valid in their respective countries. How many years do two people have to live in Ontario in order to be considered common law? Also, does a common law partner have the right of equalization of property in case of a breakup? @Dimitrova – Regarding being considered common law, the amount of time is going to depend on what legal right or obligation you are referring to. For common law partners, there is no automatic right to an equalization of property. However, the longer and more “marriage like” the relationship, the more likely a court will divide property via a claim for unjust enrichment. It does make sense for common law couples to get a cohabitation agreement. For longer relationships, the legal rules are very murky, and it is quite possible that a court will not automatically assume that each party keeps his or her own assets and debts. My fiancé and I both live in Dubai. We have independently sought legal council but our lawyers are not licensed in Canada. We plan to register our marriage in Toronto. Does our prenup need to legally be signed off by a Canadian-licensed lawyer to be valid in Canadian courts? @Bhavna – The validity of your prenup won’t depend on that. But it does make sense to sit down with a Canadian lawyer and have your prenup reviewed to see if it would be valid under Canadian laws. It may well not be, or it may be valid but not have the effect that you expect it to have. IF MY SISTER REMARRIED AND SIGNED A PRENUP WITH A LAWYER PRESENT ,CAN SHE CHANGE THE PRENUP BY HERSELF WITH A WITNESS (ME).SHE WAS TO LET HER SECOND HUSBAND LIVE IN HER HOUSE AFTER SHE DIED, BUT AFTER A ROCKY 4 YEARS. SHE WANTS TO GIVE HER CHILDREN THE HOUSE IMMEDIATELY AFTER SHA PASSES AWAY. @Henry – No. One can’t change a prenup unilaterally. I have a prenup in place where it excludes my husbands house and business. 5 years after getting married he sold that house and we bought another house jointly. If we separate do i have deduct the value of his first house sold from our joint house then divide the rest since it was listed in the prenup?. For example his house sold for $600,000, we used it as down payment for a joint home that cost $900,000. Our joint home is now worth $1.2M. If we separate and sell the home do we minus the $600K from the $1.2M and split the difference? @Halley – You will need to look at the specific wording of your agreement. Typically, if an asset is excluded from division, there will be a provision in the agreement stating that not only is that asset excluded, but any assets substituted for it is also excluded. I have a prenup done by lawyers 10 + years ago in Ontario, and signed properly with lawyers. We also live in Ontario. My wife is from abroad and gained her citizen ship post marriage and several years ago. The prenup states that we both contribute equally to the marriage expenses and that in the event of divorce neither is entitled to any support from the other – basically what is hers is hers, and what is mine is mine. Once we had children (almost immediately after marriage) My wife refused to return to work despite my many suggestions/urging her to continue her career path. She did return part time until our second child was born. From her second maternity on she has refused to work in her career. She has argued and made various unilateral contingencies so she can remain home….until my kids are in full time schooling (which has been for three years now). The children are 10 and 7 years old. We had agreed to pay our living expenses 50/50. She modified it so that she pays 25% (fixed dollar amount since we started 10 years ago) and I pay 75% (+ I pay all expense overages and additions), so her monthly contribution is fixed as she argued that she contributes by taking care of the children (which is debatable as she does minimal supervision and care and expects me to cook, clean and do most home chores regardless of the fact that she is home all day and I am at work full time). She receives money from he mother. Our matrimonial home was purchased 7 years ago and we had a prenup update to include the ownership details in our prenup (I sold my properties to pay for the matrimonial home)….she wanted to contribute and be named on the deed (tenants in common as recommended by the prenup lawyer). The prenup outlines the price we paid, the initial contributions and ownership formula to account for additional lump sum contributions over the regular mortgage payment to determine the % ownership of the home we each have. The home is now payed in full, and by the prenup details and her contributions she owns 10% of the home, I own 90%. How would a separation with our prenup agreement and history explained above fair in a divorce? She has of course threatened me with every possible thing……like saying she would be pleading ignorance in that she was not aware of what she was signing, and that I should leave the home, and that she would take everything and the kids ( I of course want my kids with me, I believe I am entitled to 50% minimum time with them and would gladly take them for 100% of the time with visitation for her – is that even possible? I have been reading about horror story divorces that are terrifying). I have balked at taking the divorce step because I fear losing my children. She threatens to everything possible to make me pay. I never thought this would happen but I take solace in that prenup should this go to divorce. Can you please comment, opinion on what would transpire in a divorce with the details I have given? @Robert – Sorry to hear about your situation. If the agreement was not only created, but at some point modified, and your wife had a lawyer both times, then likely the property division sections of your agreement will stand up in court. Spousal support will be a bit more complicated, as if she is not working, she may not be able to support herself without spousal support. That being said, especially if both children are in school full time, she would be expected to get a job and work toward self sufficiency. As for the children, that won’t have been dealt with in your prenup. You would really need a full consultation with a lawyer, particularly about the children, and also to discuss whether you may want to pay spousal support voluntarily for a short period of time to allow your wife to get back into the workforce. I have a prenup and am considering divorce from my wife and have a few questions. We have two young children. I have a similar situation to Roberts. My wife is a housewife and does not want to return to work despite past promises made, and encouragement to do so. To your suggestion of temporary spousal support during a divorce despite the prenup, would it also be a possible scenario where while getting divorced two spouses still live under the same roof (but not share the same bed)? This would be like a form of support for the required year of separation before a divorce is finalized. Or would you suggest moving out of the home even though that would create separation for one of the parents from their kids during the separation period, and also financial strain? I own my home outright and it is stated in my prenup, so I don’t see how I would leave my children and home while my wife lives there during a separation period and then have her move out once the divorce is finalized. I also believe my wife would fight leaving the house and kids before a divorce finalization. Second, what if after say a year of agreed support to a non-working spouse that spouse is still not working, or supporting themselves, by choice, or by bad luck in not finding work being pleaded. How would that compromise the divorce procedure, and the other spouse? Is a cut off allowed where the working spouse would finally not be responsible for support as agreed in the prenup regardless of a drawn out unemployment status? Third, is child support determined by a set formula? I too would like full custody of the children, but am I entitled to 50% custody no matter what? Is the child support determined by each spouses income? If one spouse has no income does that mean they are not responsible for any support and can take the children and take the other spouse for full support payments of the children? My worry is that my spouse would take advantage and use the children as leverage to gain support payments to maintain her non-working lifestyle even though she is not entitled to alimony according to our prenup. Lastly, I have a question regarding the 1 year of separation before a divorce is finalized. How is this period determined? Is it a year from when one of us files for divorce? Or is it an agreed upon date, even before any filing was done? I heard somewhere that it is an agreed upon and undisputed date acknowledged between both spouses regardless of when filing, or serving of papers is done. Thank you in advance for your response and informed opinion. @Edward – Yes, two separated spouses can live under the same roof, and in fact, often do so for financial reasons or until a parenting arrangement is worked out. Typically, in that situation, the expectation is that finances will continue to be handled the same way as prior to separation, although ideally this should be made explicit in an agreement. It is a very difficult situation to live in and ideally the length of time one lives like that should be minimized – so, an agreement should be made regarding parenting and a schedule for your wife to move out. As for a spouse not working after a year, a court is going to look at the person’s efforts to find a job, and you have the right to ask that your wife provide this information. Yes, there is a child support formula, based on the payor’s income, with the recipient’s income being taken into account in cases of shared custody. Both parents have an equal right to custody. The date of separation is when one party decides that the relationship is over, and takes steps in this regard. So, for instance, if you move to another bedroom in your house and make clear to your wife that is permanent, that would generally be the date of separation. Given all of your questions, and the situation that you are in, I would highly recommend setting up a consultation with a lawyer. My answers have really just touched the surface, and there is a lot more to it. Is it possible for a woman to get very little in a divorce with a prenup. Why have a prenup, why not just not get a marriage license. From what I am learning it’s the marriage license causes issues with assets division. There are Americans getting married without get the state involved. @Mike – I’m not sure what you mean. If you get marriage, then there are certain law governing the consequences of getting divorce, most notably the Divorce Act. You can live together without getting a marriage licence, but then you are not married. Even in that case, there are laws governing how property gets divided and support gets paid, so while you are under a different legal regime than the Divorce Act, you still have various legal rights and obligations. How likely is a spouse who signed a prenup at the beginning of the marriage successful in not abiding by the terms in the prenup they signed? My husband and I signed a prenup 10 years ago where no support was owed to either if we went our separate ways. Our house was purchased and share of the home was noted in the prenup and determined by each spouses monetary input. My husband decided to start a home business and take care of the kids at the same time. His business is now non existent and he contributes a reduced amount that was we initially agreed Upon. He argued that since he was home he did the home chores and took care of the kids so I was forced to pay 3 quarters + of our monthly expenses (including any extras and overages) and he only pays 1 quarter of what we initially agreed upon that would be our monthly imput – since he was a stay at home dad. This has gone on now for 6 years! My husband is home all day. He does not work a paying job. He does not keep the house while he is home. He does not clean. Just does basic stuff for himself mainly. He does not cook family dinners, only quick snacks for himself and the kids. He does his own laundry and the kids laundry once and week. He also picks up and drops of the kids (6 and 9 years old) at school. I am seeking a divorce, as he is uninterested in changing his employment status or anything else in the arrangement he has forced onto me which he brought on as temporary. He is now not even sleeping in the same room as me. Can my husband deny all of the things that we agreed to in our prenup? No support owed by either to either since he refuses to get a job and has essentially become dependent on me to support his lifestyle which I do not do so willingly. Can he demand more of the house value that is stated in our prenup….he basically stopped paying any of the mortgage when his business stopped and he has been contributing for living expenses (barely) with his 1 quarter fixed amount that has not increased in over several years. Help! We serve the following localities: Toronto, Ottawa, Mississauga, Brampton, Hamilton, London, Markham, Vaughan, Kitchener, Windsor, Burlington, Sudbury, Oshawa, Barrie, St. Catharines, Cambridge, Kingston, Guelph, Thunder Bay, Waterloo, Brantford, Pickering, Niagara Falls, Peterborough, Sault Ste. Marie, Kawartha Lakes, Sarnia, Norfolk, North Bay, Welland, Belleville, Cornwall, Haldimand, Timmins, Quinte West, St. Thomas, Woodstock, Brant, Stratford, Orillia, Prince Edward, Clarence, Rockland, Brockville, Owen Sound, Port Colborne, Thorold, Kenora, Pembroke, Elliot Lake, Timiskaming, and Dryden.